It’s the beautiful Spring season again! In other words, it’s time to start contemplating and planning for some new, important & exciting home remodeling upgrades for the upcoming year… And what better time is there to do it other than now!? If you are planning to remodel your basement and turn it into an comfortable and functional space that your family and guests can enjoy, there are some fundamental things you need to consider; Whether you are looking to splurge or do a basic renovation on a budget, transforming your basement into an inviting space should include working with the walls, ceiling, flooring and lighting. Additionally, there are many unique and cool ways you can decorate your basement space to make it look and feel like the rest of your home. 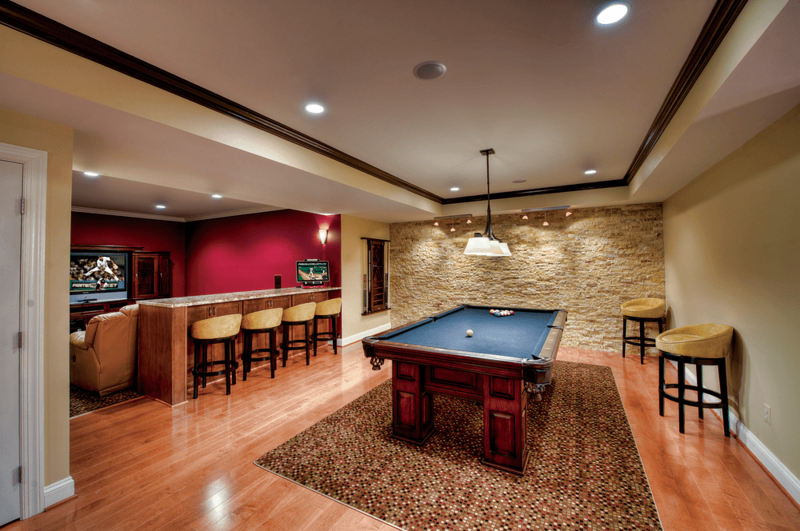 Oh, wouldn’t you agree that Fall and Winter seasons are by far some of the best times to enjoy your basement space with friends and family gathered around to enjoy a few good drinks and perhaps play a game of pool in your own basement! 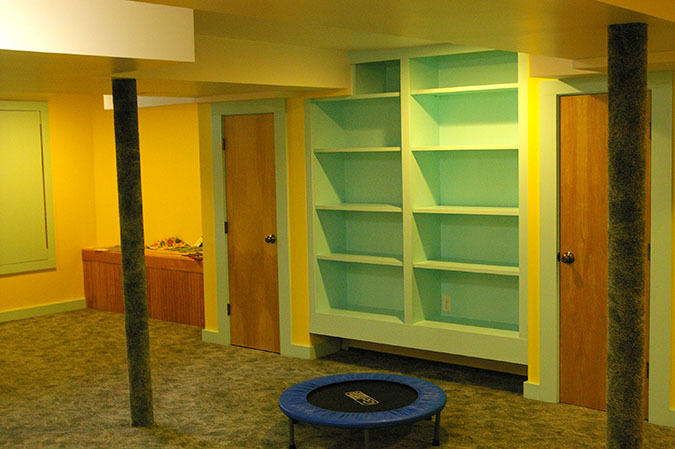 Chances are your unfinished basement has unattractive gloomy walls that make it look like a secondary space. No matter how you slice it, walls made out of poured concrete or stacked concrete blocks just don’t look cozy. To turn this around, you need to cover up the concrete walls and there are a variety of materials you can choose from. You can consider using drywall, plywood, paneling, or paint over the concrete, depending on your budget and aesthetic preferences. 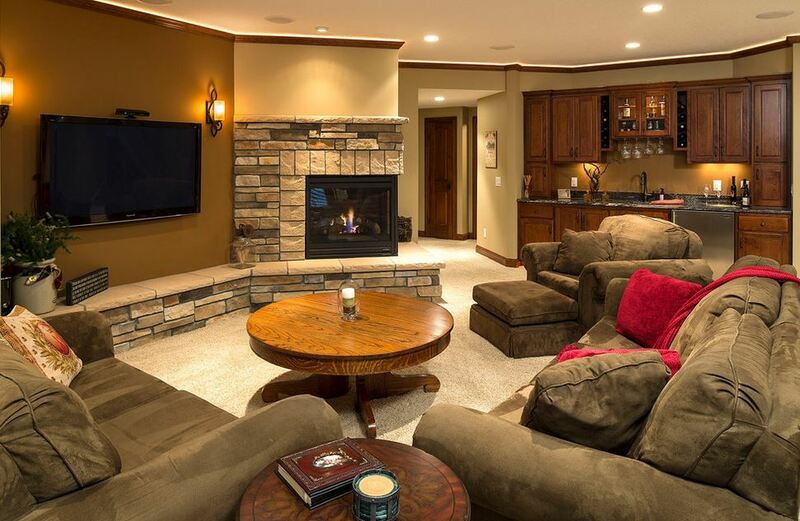 To create the right ambiance, it is critical to finish the basement ceiling. Here are some things you can do. 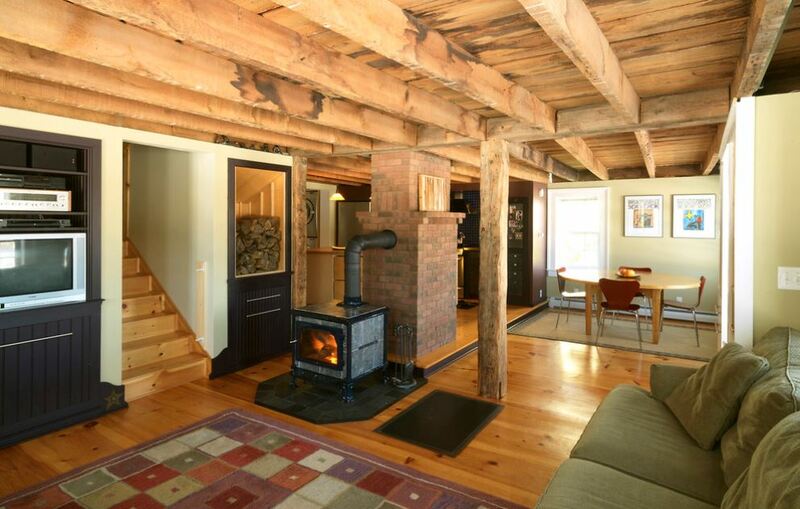 You may conceal the joists, pipes, and ductwork with drywall or paneling. Another option is to hide everything with a suspended or drop ceiling. Yet another choice you have is to leave the ceiling exposed and use a sprayer to paint it with a color of your choice. Basement floors are typically cold and unpleasant, made of concrete slab. The good news is that concrete accepts most common flooring choices, such as paint, vinyl, laminate, tile, and carpet. You should avoid wood flooring in the basement, because wood shrinks and expands, causing gaps and warping. To give your space a warm feeling and make it comfortable for children to play, carpeting may be an ideal option. Consider installing carpet tiles, which are growing in popularity, because a tile can be easily replaced if it gets damaged, without the need to replace the entire carpet. Consider installing waterproof carpet tiles specifically designed for basement spaces. 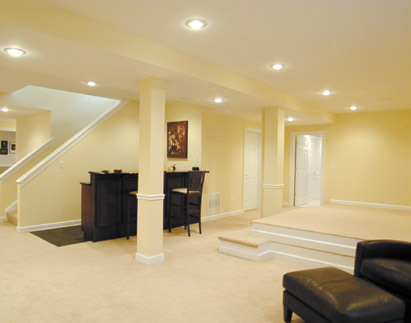 By their nature, basements tend to be dark, poorly-lit spaces, so carefully choosing and positing lighting is an essential element of successful basement remodeling. By far, the best lighting choice for basements is recessed lighting, as you do not want any light fixtures to hang from the ceiling and make it feel even lower than it already is. Another great idea is add accent lighting to the bookshelves and any artwork you have, which makes it more functional and also highlights your family’s precious collections. An unfinished basement is a common space where all the junk that you don’t need, but feel bad throwing away ends up in. 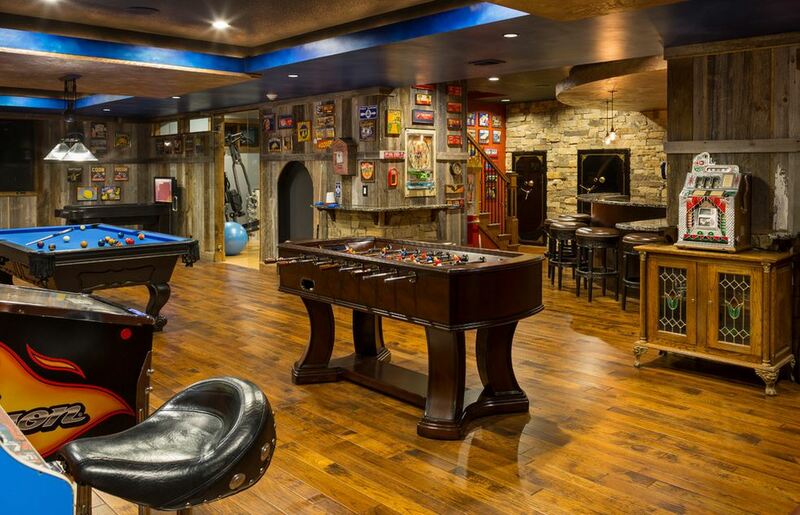 When you finish your basement and turn it into a living space, you need to do something about all that stuff. The best solution is to get rid of things you don’t actually need, and to build functional storage shelves into the basement walls, that will help you keep everything organized. This way, your basement can still be a place where you store your stuff, but without all the clutter and chaos. The colors that you choose for your walls, ceiling and trim will make a dramatic difference in the look and feel of your basement. One creative way to make the space feel cozy and visually appealing is to paint the ceiling and walls the same color, which will result in an enveloping feel. If you are looking to turn your basement into a home theater, consider painting the walls and ceiling black, it creates a stunning visual effect of expanding the space and making it look like there is no ceiling when you and your family and watching movies together. On the other hand, if you want to create a sense of height, it is best to go for light colors both for the ceilings and floors. When it comes to trims, it is best to use the same trim as you have in your house, to create a consistent look. More Cool Ideas to Consider! If you happen to have a round shaped-basement, similar to the one pictured below, then you will probably like the traditional basement, with home theater, kitchen and a bar, round coffee table, cozy sofas, and a beautifully-integrated fireplace. If you would like to incorporate that Rustic look and feeling into your basement, consider adding reclaimed wood furniture, cabinets, and or countertops for your bar.